Introducing new color-changing bling – the kind that goes well with anything under the sun! You can choose from new bracelets, necklaces, bangles, and rings that all change beautiful colors with sunlight. Del Sol’s new Sol Shell line has a deeper luster indoors without sunlight and a brighter color change outdoors with sunlight – better than anything you’ve ever seen from Del Sol’s color-changing jewelry line. 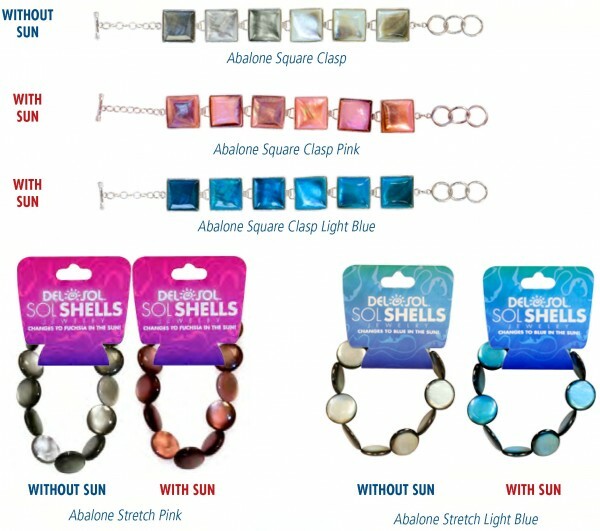 Necklaces: These beautiful, opalescent shell necklaces not only catch the sun’s attention, but your friends’ as well. They feature new, updated styling in new lengths, new materials, and new looks. They make a colorful compliment to any color-change outfit. Bangles: These stylish, colorful bangle bracelets are the first of their kind from the Del Sol product repertoire, and they’ll fit in perfectly with their amazing color-change vibrancy on a thick, sturdy bangle. They’re available in two sizes to fit everyone. Sun Rings: These sun rings manage the magic of color change at your finger tips. They feature smooth-on-your-finger materials that combine to bring out even more color-changing vibrancy than ever before. They’re now available in new sizes that will appeal to color-change fans of all ages. Sizes 5-8.